As I tracked my great grandfather Samuel Atcherley back through time via the England and Wales census records, I began to find out more about the family he had come from. Not just his parents – agricultural labourer Henry and his wife Mary – but also his many siblings. I soon found myself delving into the lives of those brothers and sisters, one of whom was named Fanny Atcherley [ ]. The 1871 census was the only one which enumerated Fanny (then aged 2) with her family, in one of the cottages at Sidney in the parish of Kinnersley (now Kynnersley). I found her on the following census living in the adjacent parish of Preston on the Weald Moors, but when I looked at the schedule to learn more I was, to say the least, intrigued. Why was Fanny, along with 23 other girls, living at a place known as Preston Hospital – and recorded as a scholar? The head of Preston Hospital in 1881 was a 38-year-old Scot named Annie McLeen, whose occupation was described as “Matron of Institution”. Her sister Jane, aged 48, was Assistant Matron. Both were spinsters. Next on the census schedule was Jane Clayton, a domestic servant, and she was followed by the aforementioned two dozen scholars, all girls aged from 9 to 15 (though the ages given may not have been entirely reliable – Fanny Atcherley was said to be 11 when she was in fact 12). Sixteen of the girls were from Shropshire, but others had been born in Staffordshire or even further afield. After the scholars the hospital’s ‘inmates’ were listed, each described as a “Pensioner of the Hospital”. The ladies were aged from 65 to 91 and, as with the girl scholars, the majority were born in Shropshire. There were 24 of them, with the names of two more crossed out and noted “absent for a few days on leave”. Finally, there was another domestic servant, and five visitors of varying ages and occupations. “Preston Hospital, near Wellington”. Picture © Rob McCrorie. 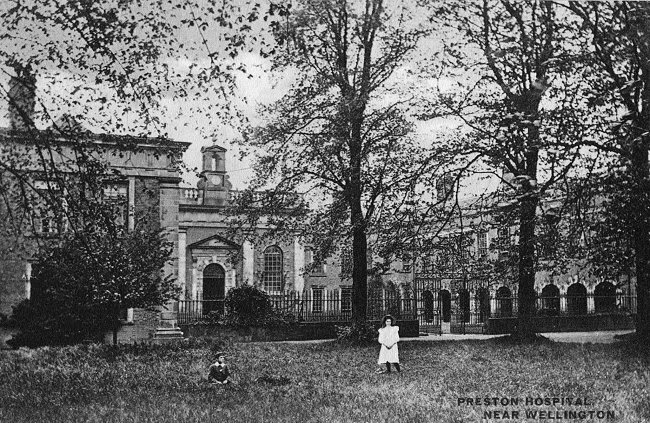 Preston Hospital, as it is called, was founded by Catherine Lady Herbert, widow of Henry Lord Herbert of Cherbury, and daughter of Francis Newport Earl of Bradford, who by her will dated April, 1716, left the sum of £6000 to be laid out in the purchase of lands in the county of Salop, and building an almshouse thereon for twelve poor women and twelve poor girls; and further directed that the Earl and Countess of Bradford should appoint the recipients of the said charity. Her brother and executor Thomas Newport, Lord Torrington, by his will, dated January, 1718, gave his real estate at Preston on the Wild moors to be applied to the same use as the £6000 left by his sister, Lady Herbert, and a further sum of £1000, to be laid out in the building of a hall in the middle of the Almshouse. The Almshouse thus endowed was built about the year 1727, and twenty women and twenty girls were at first appointed as recipients of the charity, preference being given, in the case of the women, to those who had once moved in a higher position. The charity was augmented in 1802, by a bequest of £4000 from Charles Henry, last Earl of Mountrath, and in 1827 new buildings were added as wings to each end of the Hospital, and the number of women increased from twenty to twenty-seven. The candidates are nominated by the Earl and Countess of Bradford for the time being. They must be members of the Church of England, and not less than sixty years of age at the time of their nomination. Each of the twenty-six recipients receive £18 a year, and twenty of these a further sum of £8 a year from the bequest of the Earl of Mountrath. For funeral expenses £5 is allowed. Two tons of coal are also supplied to each, as well as separate apartments and a small garden. Upon admission to the Hospital, each pensioner has to deposit £10 in the Savings Bank, for the purpose of providing herself with such medical assistance as she may require. The girls are also nominated by the Earl and Countess of Bradford. They are admitted at the age of ten, and are boarded, clothed and educated free of expense to their parents, till they are sixteen years of age, and on their leaving the Hospital a sum of £5 1s given them to supply them with clothing. The hospital building itself has been described by architectural historian Nikolaus Pevsner as “a most spectacular example of Georgian almshouse architecture”, “both grand and sober, inspired perhaps by the Chelsea Hospital”. It was originally built so as to form three sides of a square, with a large hall in the centre. The hall was used as both a chapel and a school. The almswomen or pensioners occupied apartments in the west wing of the building while the girls lodged in dormitories in the east wing. “Preston Hall” (the former hall of Preston Hospital). The building now belongs to Preston Trust Homes, the proceeds of the sale funded new almshouses in nearby Newport. Schooling was the responsibility of the Matron. The expectation was that on leaving, the girls would go into service, so their education was doubtless slanted towards practical skills such as needlework. The older girls were also taught dairying. With only two domestic servants employed in an institution housing two dozen or so elderly women, it is clear that the girls would also have provided domestic services to the almswomen. Popular Victorian author Eliza Meteyard stayed as a guest at Preston Hospital from the Autumn of 1853 until the following Spring, and wrote an article about her experiences which was published, anonymously, in Chambers’s Journal of Popular Literature later in 1854. (She later wrote a three-volume story based on her observations of almshouse life, entitled Lady Herbert’s Gentlewomen.) She was visiting an old acquaintance who was then a pensioner of the hospital, and though her article concentrated on the lives of herself and the almswomen, she also made several references to the hospital’s girls. Eliza described for example how “one of the incipient little school-maids, in cap, bib and apron” lit her a brilliant fire at half past eight in the morning. Given that “primitively early hours” were “the fashion” at the hospital, the little school-maid had probably already attended to one or more of the old ladies beforehand. “The children are well fed, and kindly treated, and behave with great respect to the old ladies,” Eliza wrote. They also carried out some very hard work. Christmas brought the systematic cleaning of the great building from end to end; and after this came the school holidays. Such rubbing and scrubbing as there was, few can conceive. The tessellated marble floor of the hall underwent entire purgation; its quaint stools and forms were piled together in a huge heap on the lawn; the agent’s rooms, the matron’s rooms, the dormitories, the fine old kitchen, with its service of pewter-plates and dishes, the galleries, the cloisters, were all besieged by some six or seven little housemaids, in mobcaps and checked bedgowns, such as our great-grandmothers wore. Although Eliza Meteyard was a guest at Preston Hospital more than twenty years before Fanny Atcherley became a pupil there, it seems unlikely to me that life in the almshouse changed a great deal in the intervening years. Fanny was probably a resident of the institution from 1879 to 1885 or thereabouts, walking the two and a half miles home to her family at Sidney every school holiday. By 1891 however, she was much further away from home and living the life which her years at Preston had prepared her for: that of a general domestic servant. Finding Fanny on the 1891 census was not straightforward. From being shown as a year younger than she really was ten years previously, she was now recorded with an age which was two years out in the other direction. Furthermore, her surname was written not as Atcherley but as Athelly! I can only guess that the household schedule had been completed by the head of the family in the near-illegible handwriting for which the members of his profession are still known today. Doctor Ross Steele, surgeon and registered medical practitioner, with his wife Annie and 10-month-old son Ross junior, were – along with Fanny Atcherley – living in a street named The Brook in the Staffordshire village of Gnosall, not far from the Shropshire border. Fanny must have been a good servant to the Steele family, for ten years later she was still with them, at a house named The Brook in Gnosall’s High Street. However, sometime between 1901 and 1910 Fanny and the Steele family parted company. On 12 March in the latter year, Fanny was living at Flashbrook, in the Staffordshire parish of Adbaston. So was was the man she married at St Michael’s church that Saturday: Albert Edward Chalenor (or Challenor), a widowed farm labourer who was ten years her junior. Fanny and Albert Challenor were still at Flashbrook in 1911, along with their first child, Joseph, and a daughter from Albert’s first marriage, Evelyn, aged 7. Albert, a native of Compton in the Staffordshire parish of Tettenhall (even then effectively a part of Wolverhampton), was working as a shepherd. Also at Flashbrook was Fanny’s brother, my great grandfather Samuel Atcherley, who was employed as a cowman. Like Albert, Samuel had been widowed, remarried, and was living with his second wife (Jessie), a child borne by his first wife (John, aged 14) and a child from his second marriage (Fred – my grandfather). Not far away at Batchacre Gate in the parish High Offley was Henry Atcherley, a brother of Fanny and Samuel, with his family. By 1918 Albert and Fanny Challenor were living at Rugeley Road in Chase Terrace, Burntwood, where they remained until at least 1930. They were probably drawn there by the local coal mine, which provided work for labourers like Albert – and for several of his wife’s close relatives. One of those relatives was Fanny’s nephew Herbert Russell Atcherley (youngest son of her brother Henry). Herbert was married at Chasetown St Anne in Burntwood in 1928, to a bride with a familiar surname: Beatrice Alice Challenor. The couple’s entry in St Anne’s marriage register proved what I suspected: Beatrice’s father was Albert Edward Challenor. I had been unable to make this link before, as Beatrice was not with her family at Flashbrook when the 1911 census was taken. 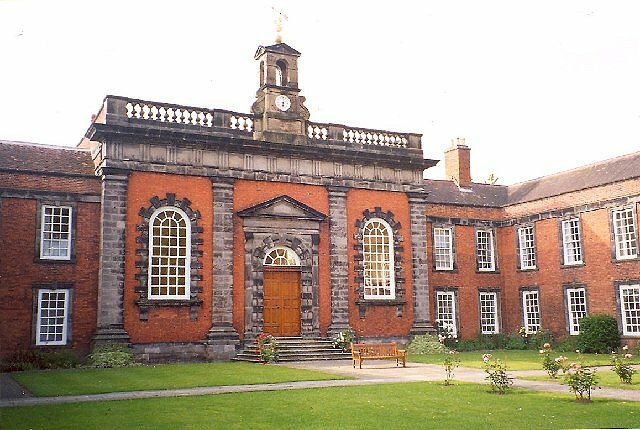 She was instead a pupil at an institution which must have been recommended to her by her stepmother: the Shropshire almshouse known as Preston Hospital. Picture credits. Preston Hospital, near Wellington: © Rob McCrorie and used with his kind permission (view original image at Flickr). The Hall, Preston Trust Homes: © Humphrey Bolton; taken from Geograph, modified, used, and made available for re-use under a Creative Commons licence. Extract from GRO marriage certificate for Albert Edward Chalenor and Fanny Atcherley: Image © Crown Copyright, posted in compliance with General Register Office copyright guidance. 1871 census of England and Wales. Piece 2805, folio 24, page 4. Birth of Fanny Atcherley registered at Wellington, Shropshire, December quarter 1868; volume 6a, page 763. Kinnersley (Kynnersley), Shropshire, baptism register covering 1869. Entry dated 24 Jan for Fanny Atcherley. 1881 census of England and Wales. Piece 2682, folio 93, page 7. “Sumleilug” (1881), Hospitals of Shropshire. In: Salopian Shreds and Patches, 7 Sep 1881, page 225. Snippets viewed at Google Books (UK), full copy viewed at Google Books (USA) via proxy server. Nikolaus Pevsner (1958), Shropshire. Pages 232-3. HMSO (1831), Reports from Commissioners: 1831. Volume 3. Charities. Page 360 et seq. Copy viewed at Google Books. G C Baugh, C R Elrington (eds.) (1985), A History of the County of Shropshire. Volume 11. Page 183. Electronic copy viewed at British History Online (website, accessed 9 Sep 2014). Sylvia Watts (2010), Shropshire Almshouses. Pages 90-95. Eliza Meteyard (1854), An Alms-House in Shropshire. In: Chambers’s Journal of Popular Literature, No. 38, 23 Sep 1854, pages 193-197. Copy viewed at Google Books. Bye-gones, Relating to Wales and the Border Counties. 1899. Page 373. Snippet viewed at Google Books. Eliza Meteyard (1862), Lady Herbert’s Gentlewomen. Volume 3. Copy viewed at Google Books. 1891 census of England and Wales. Piece 2136, folio 12, page 18. 1901 census of England and Wales. Piece 2568, folio 14, page 20. Adbaston, Staffordshire, marriage register covering 1910. Entry for Albert Edward Chalenor and Fanny Atcherley. GRO copy held. 1911 census of England and Wales. Piece 16333, schedule 106. Flashbrook, Adbaston, Staffordshire. Head: Albert Chalenor, 32, married, shepherd on farm, born Compton. Wife: Fannie Chalenor, 41, married (1 year, 1 child – living), born Kinnersley, Shropshire. Dau: Evelyn Chalenor, 7, born Wolverhampton. Son: Joseph Chalenor, 8 months, born High Offley. 1911 census of England and Wales. Piece 16333, Schedule 112. 1911 census of England and Wales. Piece 16332, Schedule 3. Spring 1919 Lichfield Division Register of Electors. Chase Terrace Polling District. Copy viewed at Staffordshire Records Office. Staffordshire Register of Electors, Lichfield Division, 1930. Chase Terrace Polling District. Copy viewed at Staffordshire Records Office. Marriage register of Chasetown St Anne, Staffordshire, covering 1928. Entry for Herbert Russel Atcherley (middle name as written by Herbert and by the clerk) and Beatrice Alice Challenor. Copy viewed at Staffordshire Records Office. 1911 census of England and Wales. Piece 16302, schedule 156, page 2. Preston Hospital, Preston upon the Weald Moors, Shropshire. Scholar: Beatrice Chaloner, 9, school, born Wolverhampton, Staffordshire. Plus other scholars, pensioners (women in their 60s, 70s and 80s), visitors, servants etc.